The ability to integrate the senses is a necessary skill for anyone who wants to live and function in the environment. The brain receives inputs from the senses and must use that information efficiently in order to construct meaningful responses. When the brain cannot integrate the information it receives, the result is an inaccurate model of the environment and an inability to function well in that environment. Individuals that have a sensory integration disorder can improve the ability of the brain to receive and process information. What is needed is an approach that addresses the foundational brain processing issues that are responsible for the lack of sensory integration ability. There are many different methods and therapies that attempt to address sensory integration problems. Many of these therapies are designed to teach the individual how to live with his or her problem. By focusing on approaches that do not address the underlying brain processing issues that may be responsible for the condition, the therapy will have only marginal effects. The Learning Breakthrough Program is a series of natural activities that may be of additional help in improving the brain's ability to receive and process information efficiently. 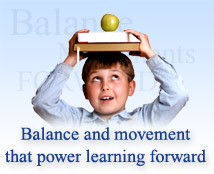 Our program recognizes the importance that the sense of balance or vestibular system has on all other brain processes. Activities that capitalize on the relationship between the vestibular system and all other sensory inputs can be a helpful addition to sensory integration therapy.